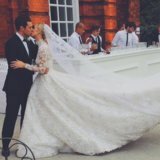 When we first spotted Nicky Hilton on her wedding day, our jaws nearly fell to the ground. Gone was the revealing white number she wore mere days before, when she accidentally flashed a crowd at Paris Haute Couture Fashion Week. And in its place? A long, lacy Valentino gown, which one could perfectly describe as "classic" and, above all, "modest." All of a sudden, our minds went wild. We knew Nicky wasn't the only bride who could pull off this style, so we did a little Insta digging - and found a trove of #ModestBride inspiration. Read on to see why you might want to consider ditching those strapless options and covering up for your nuptials. These ladies did - and they all looked stunning.